The Office of Campus Ministry and all of this year’s student leaders would love to have YOU apply to the 2018-2019 Service & Justice Immersion Program. The experiences we all have had because of the people we meet through this program and during the trips we go on, have inspired us to work hard to make this year’s program as meaningful as possible and we know you will be transformed by the experiences you have if you are able to apply and participate. We hope you will decide to say yes! The Service & Justice Immersion Program is more than just a one-week trip to a foreign city or country. It requires preparation, community building, and study to be able to get as much out of the experience as possible. 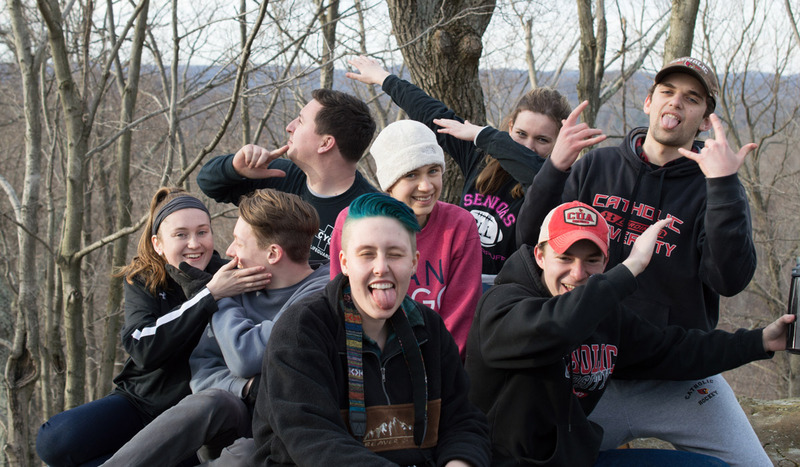 In light of this, all participants are required to attend five to six meetings before their Spring Break or Summer trip, one overnight retreat (February 1-2, 2019), and one or two meetings after returning from their trip (excluding Summer trips). Those who participate in the Border Immersion trip will be required to take a 3-credit theology class, which studies catholic social teaching and immigration, instead of going to the other meetings and retreats. While this may seem like a lot of work, the preparation beforehand will make a huge difference in your experience. In addition, you will get to meet a whole new group of fellow Catholic University students who will soon become good friends! If you have any questions, you may visit the FAQs page, or visit Harrison Hanvey in the Office of Campus Ministry, who coordinates the Service & Justice Immersion Program. He may also be reached at hanvey@cua.edu. Applications for the 2018-2019 Service & Justice Immersion Program are due by October 25, 2018 at midnight.